When it comes to food plots, you will get the best possible results in the most cost-effective way if you stick to the basics - and go step-by-step. Regardless of whether your property is large or small, the steps that will take you from no food plots to a high-performance food-plot system are pretty much the same, and you should follow them in the same specific order. One reason is that some steps depend on others having already been done. Another is that you can sometimes save money and time by performing more than one step each time you’re at the property. Finally, as we go through the steps, keep in mind that what you’ll be creating is a starting point; most plans need a little adjustment based on how deer actually react after the plan is put in place. Whether your property is large or small, your best-case scenario is to have enough acreage in plots to maximize attraction and nutrition, but without planting so much of the property that deer have no reason to move. With that in mind, here’s a formula that seems to be a good general rule of thumb. Many experienced managers put about three to five percent of the total property into food plots if only “hunting plots” are being used. Managers who use both hunting plots and feeding plots may plant 10 percent or more. Most folks who plant food plots for deer plant hunting plots. These can be anywhere from 1/10th of an acre up to two to three acres. Their main functions are to draw deer for harvest and provide nutrition. 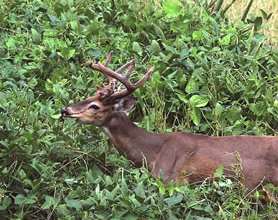 Feeding plots, when used, are usually larger than hunting plots, and their main function is to serve as places where deer can feed and feel safe. When feeding plots are used, they should be hunted sparingly, maybe just during the rut, so that deer have a feeling of safety using them. Again, this is a general rule of thumb, and it won’t be exact for all situations. Lots of factors will determine how much of your property you’ll ultimately decide to plant, such as landowner permission, equipment accessibility, time, money and lots of other factors. And if your property is small, don’t forget to consider what’s beyond your property line, because that can be a major source from which you’ll draw deer to your land. For example, say you own or lease a long, narrow tract that borders a vast wildlife area that’s not hunted much. In such a situation, you might not want to stick with the formula. Instead, you might want to plant as much of your property as possible to maximize its attraction and available nutrition because you will be attracting and feeding so many deer. Where to put your food plots? It always pays to put some thought into where you put your plots. Before we get into that, consider that it can be equally critical to think about where not to put them. One place you don’t want to put them -- if at all possible -- whether your property is large or small is where they’ll be visible from a public road. When making that determination, be sure to consider that screening vegetation, which may be there when you check in the spring and summer, may be gone in the fall and winter. Also consider planting evergreens or other natural screening plants to help shield the plot from public view. For advice on trees and other screening plants, check with your County Agent, or call the Whitetail Institute’s consultants at (800) 688-3030 x2. Generally speaking, feeding plots should be centrally located on the property. You want your deer to consider your feeding plots as safe zones so that they’ll purposefully head for them when they leave their bedding areas in the afternoon. That means that you shouldn’t hunt directly on feeding plots at all, or at least do so very rarely, for instance during the rut. Take wind into account. No matter where you hunt, chances are that the wind comes from one direction more often than any other during hunting season in your area. Design your plots so your main stand sites can be placed down wind from the most common wind direction. If possible, lay out each plot so that it can also be fully covered by a secondary stand when the wind is coming from a different direction. Proven design shapes are the “V” or “L” and the “hourglass.” These designs are often useful in deep cover and with the stand site located at the junction of the “V” or “L”, or at the neck between the two lobes of the hourglass. Since everyone’s situation is different, take into account all the factors that will make your property as attractive, nutritious and as huntable as possible when selecting the number and location of your food plots. Once you decide where your plots will be, it’s time to decide what you’re going to plant in each one. To make sure you choose the correct seed, take into account the physical characteristics of each site -- soil type, slope and equipment accessibility. Most seed blends should be planted in a seedbed that has been prepared with equipment. There are other seed blends that can be planted with minimal equipment or even with just hand tools. Some seed blends are more drought tolerant than others and some seed blends are better suited to a specific soil type and slope. You’ll also need to decide the primary purpose of each site -- whether you want the forage to attract and hold deer year-round, or to provide maximum production for part of the year, such as spring and summer for antler growth, or fall and winter for attraction and energy. Once you know the physical characteristics and primary purpose of the site, pick the seed blend that is the best match for your situation. You’ll need to know this before you begin Step 3, because it’s important to let the soil testing lab know what seed you will plant. Different seeds have different fertilizer requirements and if you don’t let the lab know what you’ll be planting, you’ll likely get general recommendations for grains – and that may not be the best recommendation for your food plot. Test Your Soil. Your seeds should be planted in a seedbed that has a soil pH between 6.5 to 7.5. The only way to be absolutely sure that the soil pH of your seedbed is within this optimum range is to perform a laboratory soil test. Tell the lab what seed you will be planting so they can precisely tailor their recommendations on how to amend the soil to achieve the optimum pH level. Lightly disk or till the recommended amount of lime into your seedbed several months before you plant if possible. Remember, proper soil pH is the most important factor you can control in assuring a successful planting. Remove existing vegetation from the seedbed. Try to get your seedbed clean of existing vegetation so your emerging forage plants will have the root space they need for optimum growth. If you are not able to rid the site of all existing vegetation, that won’t be a “deal killer,” but the more you can remove, the better the forage will perform. Once your seedbed has been limed and disked, add fertilizer as specified in your soil test report. Add your fertilizer just before you plant to ensure the fertilizer will be at full strength as seedlings start to emerge. Next, you’ll need to make sure that you plant your seeds at the correct depth based on seed size. Large seeds, such as oats and beans, can be broadcast onto the disked, fertilized seedbed, and then harrowed or dragged to cover the seeds and fertilizer under the thin layer of soil. A cultipacker (heavy roller) can also be used after dragging to ensure optimum seed-to-soil contact. Small seeds, such as clover, chicory and brassica, should be left on top of the seedbed, so don’t cover them after you’ve put them out. Just lightly disk or till the fertilizer into the top few inches of the seedbed, smooth the seedbed with a weighted drag or cultipacker to eliminate cracks, and then put out the small seeds. If you used a drag or harrow to smooth the seedbed before putting out the seed, then do nothing further after you put the seed out. If you used a cultipacker before seeding, cultipack the seedbed again after putting the seed out. This won’t cover the seed, but it will insure good seed to soil contact. Final matters: Some seeds benefit from an additional fertilization about 30-45 days after planting with 100 pounds of a high-nitrogen fertilizer such as 33-0-0 or 34-0-0. Also, consider putting small exclusion cages over part of your food plots so that you can monitor deer usage. If you have any questions about how to plant the best food plot, Whitetail Institute’s consultants are only a phone call away at (800) 688-3030 x2.